Pages can be integrated here that will be loaded when the user clicks on the title link of the starting point. 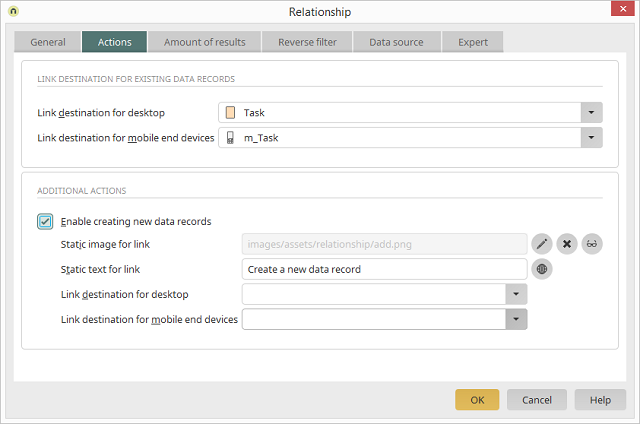 If the link destination is defined for a Relationship element, which is not a starting point, a magnifying glass symbol will be displayed when the mouse is moved over a dataset. Clicking on this symbol opens the link destination page. Allows the users to create new data records in the browser. The path and filename of the image selected for the button, which will allow users to create a new data record in the browser, is shown here. Text can be entered here that will be shown as a quicktip when the user moves the mouse over the link. The pages that should be used for data entry when the user clicks on the link can be selected here.